Plays a victory or defeat song when exiting combat with a boss recognized by Deadly Boss Mods. It will also play a song when entering combat which will loop until a victory or defeat song is played. This song can also be ended by typing "/killvs" into your chatbox. This is 100% configurable ingame. Simply open the DBM GUI (via /dbm, etc) and goto the options tab. Click on "Victory Sound" and configure it to your liking. If you wish to add your own songs, just drag the .wav, .mp3, or .ogg file to the "sounds" folder and type the name of the file in the provided edit box. Please note that you must completely exit and re-enter World of Warcraft before you can play the sound file. Victory and Defeat music is really soft. I'll probably run these thru Audacity and up the volume on the clips for the next release. Add ability to add entries to the dropdown menu automatically. Add ability to pick sounds to play at random from pre-determined lists. Update this addon so it doesn't eat gobs of memory. 1.1 - Added the a GUI configuration within DBM's configuration panel. 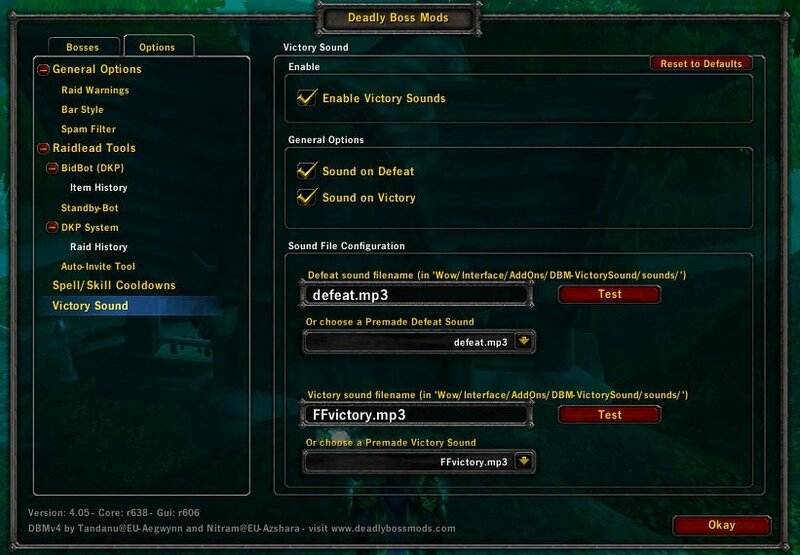 Just type /dbm and click Options --> Victory Sound. Also a few bug fixes and tweaks. 1.2 - Added more GUI config! Added a bunch of new victory and defeat songs to choose from and a handy dandy dropdown menu for choosing them. Fixed a bug with file names going lowercase, etc. 1.2.1 - Simple TOC update for 3.1, no other known compatability issues. I made a fix for DBM-VictorySound 1.9 to work with 6.0.2. 1. In folder ...\World of Warcraft\Interface\AddOns\DBM-VictorySound\Sounds\ convert all *.mp3 files to *.ogg with any MP3 to OGG converter. Delete all old files with *.mp3 extension. 2. Open file DBM-VictorySound.lua in any text editor (Notepad, for example). Find and replace all mp3 srings with ogg strings. Save changes. Close file. 3. In folder ...\Games\World of Warcraft\WTF\Account\==Your Account==\SavedVariables\ find and open file DBM-VictorySound.lua with any text editor (Notepad, for example). Find and replace all mp3 srings with ogg strings. Save changes. Close file. NOTE: WoW client MUST be closed while making changes! In game, in DBM Options->Victory Sound Options ->disable "Music on Start" option. After that you can use "Victory Sounds" and "Defeat Sounds". Not "Music on Start". (In 6.0.2 function PlayMusic() disabled by Blizzard. And MP3 files playing are disabled by Blizzard too. WoW and addons can use *.ogg files only). P.S. The same fix may be applied for v.1.10.00b. It works. But that version is beta and spams many debugging messages (unusefull for us) to chat. To elaborate more, it seems to happen more often if you perform an action right after the music starts. I'd say within 5-10sec. I also realized that the music stopps if you move around or perform an action. Metroid's Ridley battlemusic?!? Yep, goes on my fav list now. Having issues with the sound cutting out shortly after a fight starts. Discovered while farming badges for my alt. Another friend (whom I recommended this to) is reporting the same thing. Tagging quotes for future reference. Besides being mp3 or wav file, are there any other requirements for the file to play in wow? (Like size, album, etc.) Because when I put one of my files in I can't preview it. Great mod, or greatest mod? Oh my god... thank you. Thank you thank you thank you! I love this mod. I love it all night, nine times. When the SMB music started playing at a boss pull, it made my day. I can't wait for custom sounds in dropdown menus, and different songs per boss =) It would be kind of cool to let the mod pick at random from a pool of sounds, just an idea! I'm happy with anything though! Love it! Nothing like hearing the Final Fantasy victory music when defeating a boss. I hope you enjoy the addon. I also am thinking about adding a combat music feature that'll play a selected piece of music when engaging a boss recognized by DBM.